There couldn’t be a better time to be an online merchant. Competition might be at all-time high. But, opportunities are also aplenty! You can start your online ecommerce store and within a week or two, you could be taking home a few bucks in profits. But it doesn’t end there. As more marketing channels are developed, selling become increasingly easy. Thanks to the many marketing avenues coupled with the innovative technology, smaller merchants can now compete favorably with ecommerce giants like Amazon. Nevertheless, the stiff competition demands that you stay at the forefront of new technologies, otherwise you may quickly lose your edge and revenue across your platform my start falling fast. One such technology that promises huge rewards for merchants is Google Shopping. 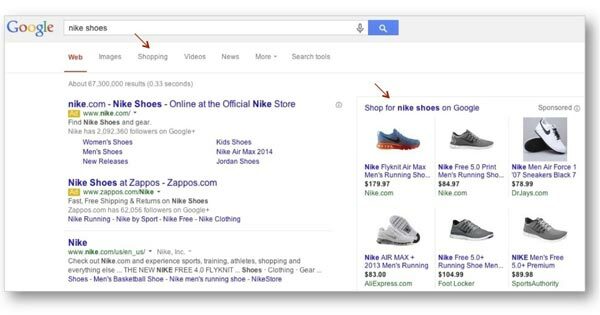 Also known as Product Listing Ads (PLAs), Google Shopping ads are displayed when a user searches for a particular product on Google. A merchant’s success greatly depends on the ability to attract new customers. On Google search, just convincing visitors to check out your site can be a masterstroke. It can be the beginning of a long relationship that could bring in huge profits in the long run. Google Shopping is that last piece of the jigsaw that will help you convince consumers to stop at your website. So, I decided to put together a step-by-step guide to help online merchants set up Google Shopping from scratch and tap into its powerful potential. First things First: What is Google Shopping and how does it work? Google Shopping, just as the name suggests, is owned by Google. The platform itself is powered by two Google tools; AdWords and the Google Merchant Center. Wait, what is this merchant center? The Merchant Center is where your product feed lives. We’ll cover feeds a little later but it refers to the details of your products organised in a Google friendly manner. And AdWords house your shopping campaigns. It’s where you’ll set your budget, manage your bids, and make any optimisations to boost performance. 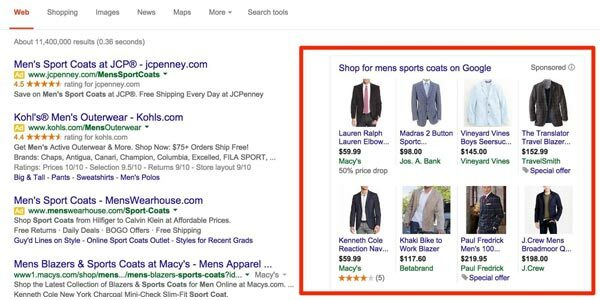 If you have used AdWords before, you will find Google Shopping somehow different. One of the main distinctions is that instead of you choosing when your ads are shown, with Google Shopping, Google dictates your ads placement. In AdWords, you usually create the campaigns on certain keywords and ad groups that you choose. But when using Google Shopping, we’ll consider other facts such as your site, feed, and bids to determine when to display your ads. Feed creation and optimisation – Your feed covers a lot of stuff, from you product descriptions to your images and even your price. A great feed guarantees better returns for your efforts. Bidding – as with AdWords, you can bid on Google Shopping in numerous ways. Find the right bidding formula to increase your chances of making any profits from the Google Shopping platform. Monitoring and optimisation – the latest Google Shopping roll out came with several improvements. The most noticeable changes coming in the monitoring and optimisation area. You can now see granular data and make regular optimisations to your campaign. Your overall breakthrough depends on how best you monitor and optimise. We’re going to discuss the aspect in great details further down. But first, let’s lay our foundation for success by looking at some basic elements. Before jumping right in, it’s prudent to ponder what you’re actually looking from the campaign. Set your goals, identify your keywords, and understand your competition. Goal setting applies to all forms of marketing. When you have goals, you have direction. Additionally, goals give you the freedom to be creative with your solutions without ever getting off track. CPA (or Cost Per Acquisition) is how much money you’re willing to spend for a customer. This can be a tough step when setting up your campaign. Consider factors such as the available budget, the lifetime value of the customer, your average margins, and so on. For example, if your average order value is $100 and you average margin 20%, and you spend $20 to acquire the customer, you will have forfeited the profits of that first order. But, if you believe that the customer could be worth thousands of dollars over the period of your relationship, this can be a small price to offer. Building a relationship or making a sale? There are two ways of doing business – making sales and making customers. 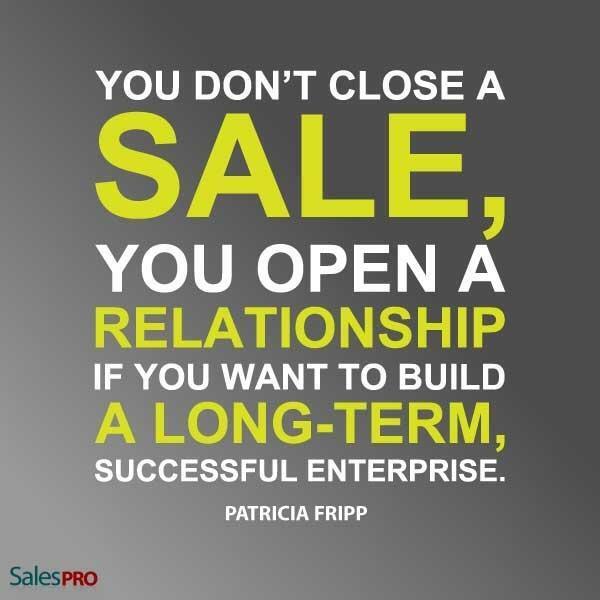 In making sales, your primary motivation is to close this particular deal. It doesn’t matter if the consumer buys from your competitor next time. Making customers is the exact opposite. Here, merchants are interested in a long-term relationships and ready to forego short term gains if that’s the price for striking a lasting and secure relationship with the consumer. If you’re just starting, we recommend that you implement both strategies but lean more towards building relationships. A good way to do this is offer low prices that get you smaller profit margins but which, in turn, endear customers to your brand. What Are Your Keywords and Top Products? In this stage, decide what products you want to sell most and make sure it’ll be a hit. “But I want to sell everything on my site,” you might be thinking. That’s rarely true. Or, if in your case it is, then it’s the first mistake to correct. In an effort to maximise sales, you need to prioritise your products accordingly. Entry products don’t have to be your biggest sellers. They just need to be products that most likely to attract potential customers. They could be lower priced products that customers usually buy more often or that they may purchase before going for the higher priced products. Think of the razor companies that sell full razors at a discount with the motivation of thereafter selling you razors again and again. That’s what consumables are. They should be a priority. These are the products that will earn you the highest revenue/profits. They should be given the highest priority. Spend most of your time working on how to sell them. There aren’t many such products left on the internet. Almost every product has very high competition. But if you’re lucky enough to have something that a lot of people need but not many merchants have in stock, seize the situation. Once you’ve categorised the products, think about keyword search. The rules remain unchanged – target longer keywords (also called long tail keywords). What we’ve discovered from our many years working with ecommerce search engines is that the longer the search query, the higher the buying interest. For example, if someone searches “Gucci”, that person is probably just killing time. It’s highly unlikely that they will buy soon. If he searches “Gucci Shoes for Men”, then there is a good chance he is looking to buy. If the search is “Gucci Lizard Horsebit Loafer”, then that customer knows what they are looking for meaning that they might be ready to buy. Use one of Google Keywords Planner, SEM Rush, or Keywordtool.io to find out the exact words your customers are using. Manual searching involves entering the search query in Google and seeing which merchants’ names pop up in the search results. Find out how many guys are in the competition, the exact products they sell, their images, and their prices. Screenshots of the competitor’s Shopping ads, complete with title, image, and price. Use this information to gauge your chances and better prepare for the task ahead. The Google Merchant Center is where your feed resides. You need it to set up tax and shipping rules. You’re required to verify that you own the site and then claim it in Merchant Center. Visit the Google Merchant Center and log into your domain register. Google will automatically access the register. 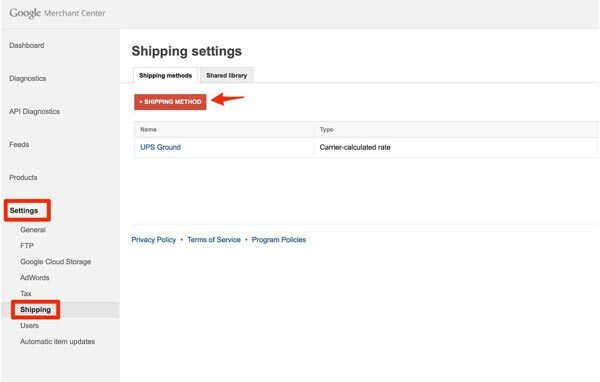 Still on Google Merchant Center, look under General Settings to set up both your tax and shipping rules. Sales taxes can be entered directly. 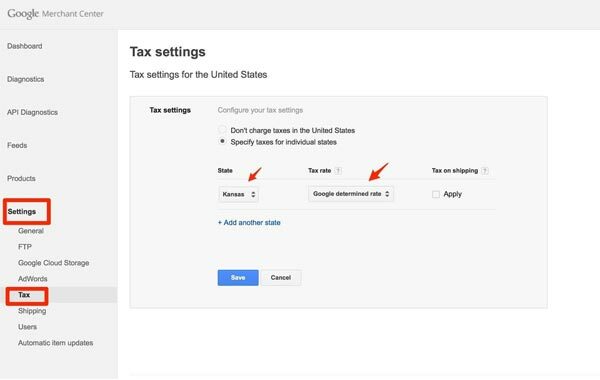 Or, just select the states/country where you’ll charge a tax and Google will help you determine a rate. Having a flat rate (that includes a shipping fee). Use a rate table to determine appropriate fees. Go to “Settings” and select “AdWords” to link your Google Merchant Center Account to your AdWords account. You’ll be asked to provide a 10-digit ID to link the two successfully. Start by creating a new campaign. Once you’re on the shopping page, it’s time to fill in a few details. Start by naming your campaign, choosing your county, and then choosing your priorities. Naming you campaign is crucial especially if you have multiple campaigns. Perhaps you have seasonal campaigns such as promos that only go live during the Christmas season and a different campaign that goes live during the Easter holiday. As for priorities, you can set your campaign to low, medium or high priority. Again, changing the priorities is important if you have multiple campaigns. When you first create a campaign, the campaign will be set to low priority by default. This is usually okay for the first campaign. But if you have multiple campaigns, you may want to highlight the one as high priority to help Google determine which products to show in search engine results. Google usually returns the product with the highest priority even if there are other products in the same category that have higher bids. By default, your campaign will be entered into Google Search and Search Partners. The partners include sites like AOL and other Google-owned websites such as Google Maps and YouTube. For the moment, keep search partners on because they help your campaign. But later on when you understand AdWords better, you can come back and decide whether to remove some of the partners. The same applies to locations. Setting your location will tell Google where you want your ads to be shown. If you don’t set a location, the ads will be shown worldwide which may cost you more. Bidding will be covered in detail later. But you also need a default bid that will be applied to products for which you don’t specify. Set a low default bid in the range of $0.2 to $1.0 depending on the price of what you’re selling and competition for that category of products. The budget should also be fairly conservative. You can adjust these with time as you learn the ropes and get a feel of the platform. Delivery however should be treated seriously. 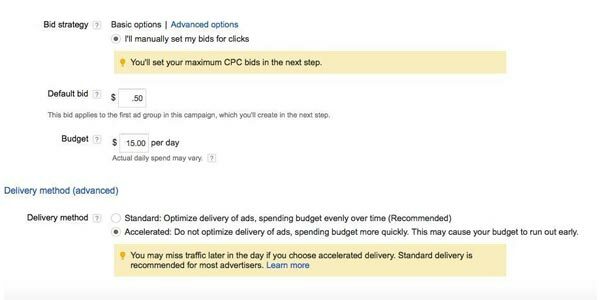 Set it to “accelerated” rather than the default “standard.” Products set for “accelerated” delivery tend to show up much faster and show up for all queries that Google finds relevant to you campaign. There are two ways to go about this. First, you can generate a tracking code from your AdWords account then drop that code on your order confirmation page. Or, for more robust analytics, you can pull reports from Google Analytics. 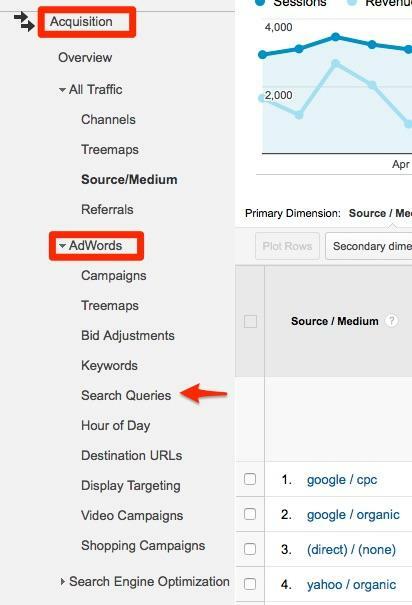 Whichever the case, you’ll need to link your AdWords account to Google Analytics to get analytics data inside AdWords and AdWords data inside analytics. Linking the two is super simple. While on your AdWords page, click on the setting (wheel) tab in the top right corner next to your email address and account ID. On the left pane, click “Linked Accounts” and select “Google Analytics”. You’ll need to have the same email address for your AdWords, Google Analytics, and Google Merchant Center accounts. 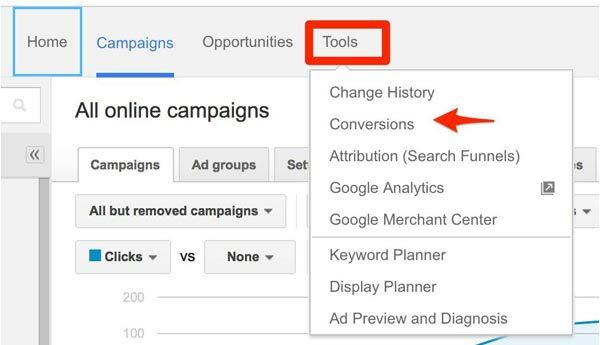 To setup conversion tracking for AdWords, click “Tools” and select “Conversions”. Then click on the red “+Conversions” button, choose “Website” as the source and follow the prompts to the end. 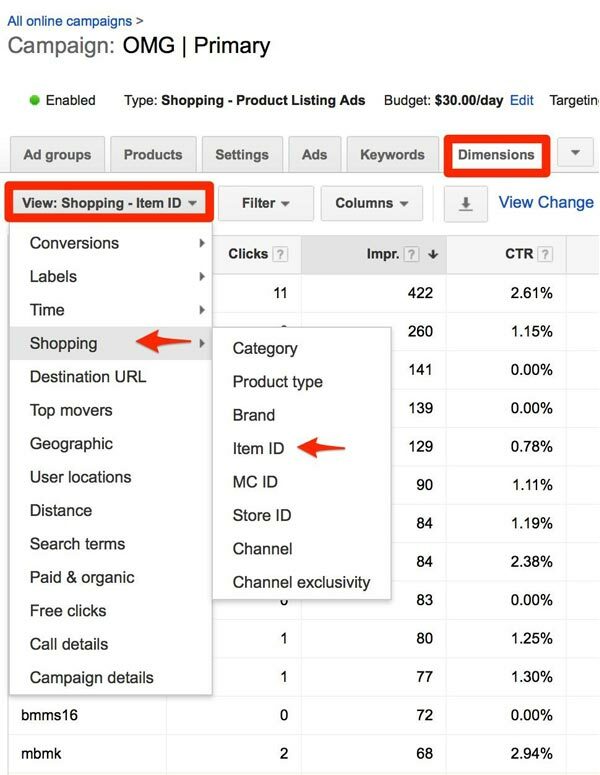 Why is it important to link Google Analytics to your AdWords account? 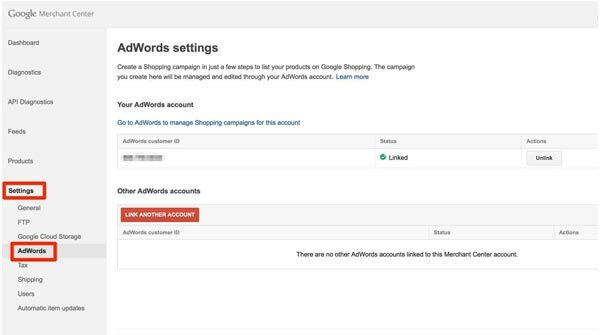 Linking your Analytics and AdWords accounts gives you an additional option for conversion tracking. Analytics is a powerful tool that can help you slice and dice your conversion data whichever way you like. For instance, any marketer would like to know the buyer’s journey. You’ll want to know if the customer came directly from the ad i.e. clicked on the ad and then proceeded to buy (also known as last click), or if they clicked on the ad but didn’t buy immediately. Maybe after clicking they took a few days, then checked in from a different device to make the purchase (first click). All this information is available on Google Analytics. Average pages viewed per session, bounce rate, and so forth. These additional metrics can help you better optimise your campaign. Your Google Shopping Feed contains information about the products you want to sell. Google crawls your feed from time to time to determine if one or more of your products are relevant to a search query. If relevant products are found, Google then makes a decision on whether or not to display them next to the search results. Building a feed can be done in two ways. 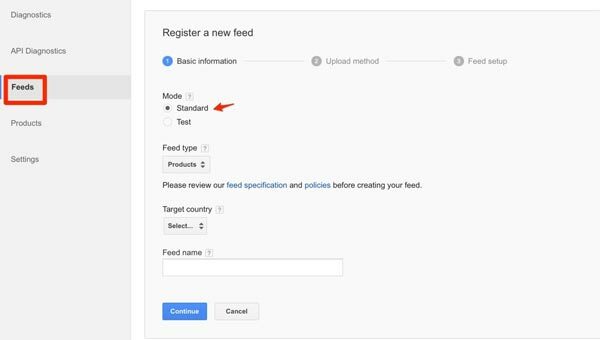 First, you can create the feed manually by entering your product information in a spreadsheet and uploading the spreadsheet to Google. Alternatively, you can use an extension or plugin that can help you pull data from your site. This second option can be particularly useful if you have hundreds to thousands of products. 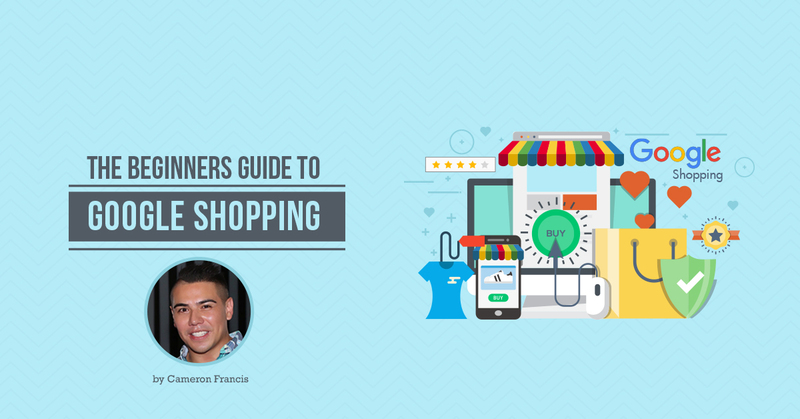 Whichever the case, these 13 aspects are vital for the success of your Google Shopping. Your product titles should be accurate and descriptive to give Google an easy time understanding the products. Include your keywords to make the titles visible to search engines, try to use the name of the product, use colors, brand, gender, and size to differentiate your items from competitor’s products, even add any other important information that consumers usually type in the search engine when searching for that type of product. Don’t keyword-stuff however. Don’t just add keywords within the title for the sake of it. Additionally, don’t add promotional text. Google is against the use of promotional language in product titles. Phrases such as “20% Off” are not welcome. Finally, don’t use all CAPS otherwise your feed may be disapproved by Google. Next, ensure that you have product descriptions and that the descriptions are as informative as possible. Each product must be concisely described by highlighting qualities of the product that the consumer might type into the search engine. Another good idea is to load the front part of the description with the most important information and ensure to use your keywords somewhere within the text. As with the title, however, don’t be vague and don’t just write for the sake of it. A short, punchy description is better than a long watered-down one. Google has created a long list of categories. You’re required to select which category each of your products falls into. This will help the search engine better understand the products. There are over 6,200 categories so it might take a bit of time to categorise all your products. But it’s a required step that you can skip. Start by downloading Google’s taxonomy. Then carefully select your categories. Since you can only choose one category for each product, take your time to select the most appropriate category. If you couldn’t find a perfect category match for a product in (c) above, product type will help clarify your product to Google. This time, use your site’s taxonomy. When on the product page, you’ll see a breadcrumb such as home > door parts > main door > locks. From this, Google will have an idea of your product type. Copy and paste the breadcrumb into the product types field in your feed. When your product is displayed alongside your competitors’ products on the search result page, your images will play a major role in getting searchers to click on your products. Beware that the images that appear on the search page are tiny. So, you need high-quality image that are visible even in a thumbnail. The background image has to be white as shown below according to Google’s regulations. And, there can’t be text, watermarks, or logos on the images. Other than that, go for professionally shot images taken at perfect angles in well lit environments. In sales, where two products are exactly the same, price then becomes the differentiator. This holds true for Google Shopping too. Consumers will go for the lower price. On the other hand though, having higher prices can help attract “high-end” clients. If you deal in fine wines, for instance, lower priced products may not attract your ideal customers. In other words, get your pricing right. But since you’ve probably been retailing for a long time you should know this by now. Consumers often search by brand name meaning that you need to indicate your brand name in Google Shopping. Google also recommends it. So, it doesn’t matter if you’re selling your own brand or reselling someone else’s products; indicate the brand name. The two acronyms refer to the Manufacturer’s Product Number and Google’s Trade Identification Number. MPN are used as the SKU while GTINs can be your UPC code or ISBN number if you’re dealing in books. You’ll need two out of the three. We already covered sales tax under Google Merchant Center. We recommend that you indicate it when setting up Merchant Center. But you can also specify it here. Same as sales tax, shipping is better specified when setting up Google Merchant Center. But, you can also specify it here. For those selling clothes and other apparel products, there are a few other data points you can provide including gender (male, female, unisex), age group (newborn, infant, toddler, kids, adult), size (mention the actual size of the product), and color (mention actual color of the product) among others. There are data points that if not provided under your feed may render your products ineligible for Google Shopping. The first one is availability. There are three states of availability; “in stock”, “out of stock”, and “preorder”. The second one is condition. Only two conditions are accepted; “new” and “used”. Lastly, custom labels are not required by Google but can be added for your own benefit. In fact, Google won’t consider the labels when deciding whether not to show your products. Quality score in Google Shopping is meant to encourage to advertisers to create awesome ads and landing pages that consumer love. In AdWords, you can even see the quality score of each keyword. The idea remains the same in Google Shopping. Although you cannot clearly see what your quality score is, each product usually has a score for relevant search queries. The score is determined by you CTR, ad relevance, and landing page experience. The quality score directly affects your ad rank (the position of your ad on the search result page). Ad Rank = Quality Score X Max CPC. One way to look at this is that a higher Quality Score can allow you to have a lower CPC and still outrank your competitors. If you remember, we mentioned that there are two ways of setting up your feed in Google Shopping; manually or automatically. Manual setup works best if you’re only dealing with a handful of products. When you have a lot of products, automated set up is a better idea. “Automated” isn’t actually the right word because you still have to do a lot of work. But you’ll also be relying on certain software programs to pull data from your site. More importantly, although this option works very well if you have lots of products to deal with, you need to be extremely careful with the software program you’re using to pull the data. If the software gives you the wrong data, it can be a disaster as your products might never be accepted on Google Shopping. So, you must pick the right automation process and cross check to ensure that you’re getting the right data. Two automation software programs that work just fine are Data Feed Watch and the Google Shopping app for Shopify. Once you’ve decided which method you’ll use; manual or automatic, click on “Feeds” then the red “+Data Feed” button. From there, if you’ll be feeding the data automatically, just select “Automatic Upload (scheduled fetch)” or “Regular Uploads By User” depending on the specifications of the software you’re using. Other than your feed, bidding is the most important part of Google Shopping campaigns. Your bids will determine what queries your product show up for and can play a starring role in the overall profitability of your campaign. Bid too low and you may never show up for any queries. Bid too high and you may never make any profits from the campaign. The idea is to find a sweet spot somewhere in the middle where you get to consistently show up for the right queries, close sales and generate meaningful returns on your investment. We have a few ideas on how to do this. Product price – the price of each unit of your products should help you determine what would constitute a good bid. In other words, a box of razors that is priced at $1.50 cannot have the same bid as you Gucci shoes priced at $1,500. It doesn’t make sense. Profit margin – how much will you be getting from the sale in terms of profits? The larger the profit margin, the higher your bid should be. Ecommerce conversion rate – what’s the average conversion rate of your ecommerce shop? From a business point of view, it’s better to bid higher if you’re sure of converting plenty of sales. With those three factors noted, here is how to determine your MAX bid. Once you know your MAX bid, you can scale down over time. Sale price – Cost of Goods = Profit. MAX CPC x (.4 to .75) = Initial CPC Bid. If you don’t know your ecommerce conversion rate yet, there is a simplified way of determining it. It has been found that paid traffic convert at about 70% of organic traffic. So, just multiply the conversion rate of your website by 0.7 to find an approximate conversion rate for your ecommerce site. This is perhaps the highest part because it depends so much on your business and how your initial bids are working. Overall though, at the initial stages when you’re just getting started with Google Shopping, you may have to bid higher to gain more impressions and clicks. We recommend increasing your bids steadily over the first few weeks. This is especially important if your ads aren’t getting impressions or clicks and you feel you built a quality feed. Bum the bids y between $0.3 and $0.9 until you see a shift in fortunes. The other thing you need to remember is that Google ultimately decides what ads are shown in search engine result pages. In the early stages, they may choose not to show your ads a lot until they’ve seen how consumers react to the one or two ads they are showing. But once they feel that users are having a positive experience with your products, your ads will show more often. Well, one reason is that if your delivery is set to “Standard”, you may have to bid more to get more attention from Google. Standard means that your ads are shown evenly throughout the day. Google isn’t a big fan of that. The search engine wants to display ads whenever a search query matches your products. So, if you’ve chosen “Standard” delivery, bid even higher in the early days. Lower bids work best with long tail keywords. Interestingly, long tail keywords, if chosen well tend to convert better! Higher bids can help when you just want exposure for your brand, for instance, if you’re launching a new line of women perfumes and want maximum exposure, bid highly. You can also big higher if a product is selling really well. Why… to see if you can sell even more of that product thanks to increased exposure. Finally, it’s helpful to bid higher during competitive seasons like the Christmas holiday and back to school period. The reason is that competition during these periods can be very high. How often you adjust your bids is completely up to you. But at the initial stages, we recommend adjusting them once to thrice a week depending on how they are performing. There are special bidding approaches you may also want to try. The first is SKU level bidding and the second one is RLSA level bidding. In SKU level bidding, you hold each product accountable for the success of the greater campaign. As such, each product has to perform on its own first. 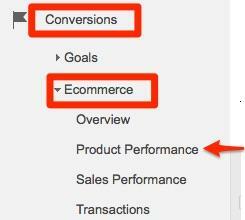 Look at your each product group, click on the dropdown arrow, and examine the performance of each product. If a particular product is weighing down the group by not generating enough sales, cut its bid or remove it from the group. RLSA bidding is a remarketing strategy where you tell Google that you want to bid higher when customers who’ve already visited your website are interacting with your ads for a successive time. You’ll be required to turn remarketing on in Google Analytics. As we come to the end, we want to now introduce you the world of reporting and analytics on Google Shopping. Google Shopping account has a good many reports to help you optimise your campaign. Products with no impressions – this usually happens when your bid is too low or if your feed isn’t helping Google find your products. Fix those two issues and the problem will disappear. Products with high impressions but no/low clicks – in this case, Google is probably showing your products but consumers are clicking on them. Most likely, it’s because your prices are higher than competitors’ prices. Or, your images are of low quality. Products with high clicks but no conversions – this is when Google is showing your products and users are clicking on them, but not buying. Likely, your product page is poor. Your value proposal isn’t impressing potential buyers. Google Shopping is a powerful ecommerce platform that can completely turn around your online presence and set you on the path to free-flowing profits. One merchant actually reported a 550% increase in revenues in Q4 2016 after joining the platform. You too can gain by similar margins. You just need to follow this guide to the letter.